The cardiac cycle is divided into four separate periods, two of the periods occurring during the relaxation phase (Diastole) of the cardiac muscle, and two periods occurring during the contraction phase (Systole) of the cardiac muscle. The first phase of the cardiac cycle is the Ventricular Filling Period (VFP) during diastole. At the start of VFP, the heart is in a polarized state and blood is moving through the atria past the heart valves and into the ventricles. As an electrical stimulus occurs from the S-A node, the myocardial cells of the atria depolarize which causes the atria to contract. This atrial contraction forces additional blood past the tricuspid and bicuspid valves, filling the ventricles. This atrial contraction is recorded on the ECG as the p wave. The second phase of the cardiac cycle is the Isovolumetric Contraction Period (ICP) which begins systole for the cardiac cycle. The ICP is the beginning of ventricular contraction. Blood is not being ejected from the ventricles during ICP, but pressure is building in the ventricles in order to force the semilunar valves of the Aorta and pulmonary artery open. The pressure in the ventricle must exceed the pressure in the Aorta for blood to be ejected from the heart. The third period of the cardiac cycle is the Ventricular Ejection Period (VEP) which is a continuation of the systolic phase of the cardiac cycle. During VEP, pressure within the ventricles has increased well above the pressure in the Aorta and pulmonary vein. 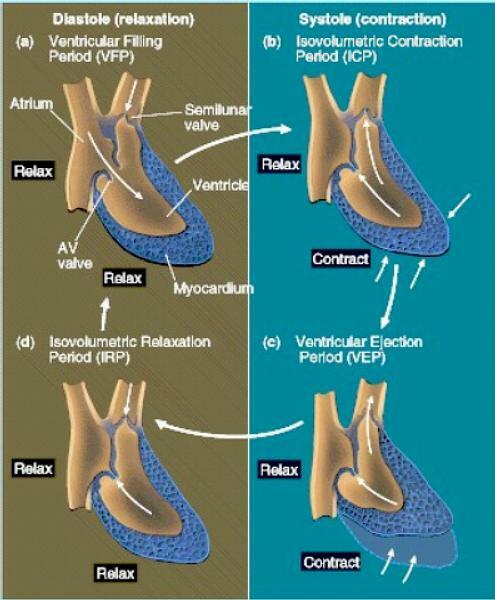 The pressure differential forces the semilunar valves open and blood is ejected from the ventricles into the arteries. Blood will be flow past the semilunar valves until the pressure gradient in the arteries exceeds the pressure of the contracting ventricles. Upon equillibrium of the pressures between the ventricles and arteries, the semilunar valves will shut, and blood flow from the ventricles will cease. The electrical recording for both ICP and VEP are illustrated on the ECG as the QRS complex. The final period of the cardiac cycle is the Isovolumetric Relaxation Period (IRP) and occurs during diastole. The ICP is characterized as the resting phase of the cardiac cycle when the ventricles are repolarizing and all valves (bicuspid, tricuspid, and semilunar) are closed. The electrical recording for IRP is illustrated on the ECG as the t wave.